Paranormal novels come in many shapes and forms. At one time they seemed to all be about vampires who found it hard to keep their clothes on, but the genre is maturing and diversifying now. There is still the chick lit/erotica escapist end of it, and always will be, but there is a deeper, darker, thought-provoking side too. It’s in this range of the spectrum that you’ll find Chris Carrolli’s books. 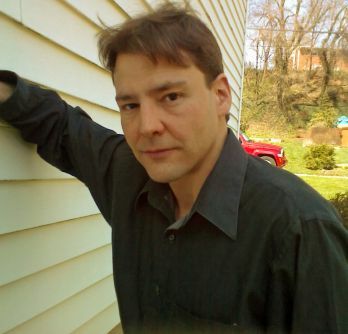 Chris has written two outstanding paranormal novels in his Paranormal Invesigator series. I reviewed the first of these, Pipeline, on this site a couple of months ago. I loved it. And The Listener is every bit of good. I’ll share my review of it in a moment, but first we need to hear from Chris. I talked to him about his writing. 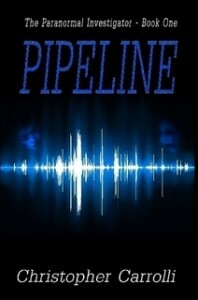 Tell us briefly about Pipeline and The Listener. Pipeline is the story of Tracy Kimball, a young nurse who survived a car accident that killed her fiancée. Now, she’s plagued by a series of paranormal incidents concerning him. She seeks out a team of paranormal investigators, who discover some surprising things about the nature of his ghostly contact. The story deals with a non-fictional paranormal phenomenon known to ghost hunters as “The Pipeline effect.” It is the term used for ghostly communication through means of technology. The Listener begins where Pipeline ended. It doesn’t continue the story of Tracy Kimball, but the investigators, who have now taken center stage. An incident in Pipeline occurs that leads to the events in The Listener. In this book, I explore a form of telepathy known as clairaudience, or listening and speaking with the dead, as well as remote hearing. Well, after a few strange occurrences in my own life and being fascinated with the “Pipeline effect,” the idea of Pipeline formed in my head. As I started writing it, I assumed it would be a short story, but after introducing my investigators, I realized I had a short novel on my hands. The Listener started off as what happened next, and I decided to write about another paranormal aspect that I was fascinated with, clairaudience. What do you enjoy most about writing about the paranormal? Do you ever scare yourself? There are unlimited aspects of paranormal to write about. It’s not hard to see why it’s a new and upcoming genre since so many of those aspects have rarely been written about or pondered before. What was once Taboo is now being written about freely, and I’m glad to be a part of that. Yes, I have scared myself already writing the third book in the series, which makes me excited about it. Which of the characters you’ve created are you most like? Actually, I’ve given each of my characters some trait that belongs to me, whether it’s a candy bar addiction or having seen a ghost. So, they all have some aspect of me that I’ve incorporated. I doubt I could pick one. No, not exactly. We as authors are encouraged to choose a photo that best represents our story and to mention any ideas that we have. I’ve been fortunate enough to find two pictures that really hit home. I mention things like colors or certain small details. But, the end result of my covers is the brilliant work of Melange Books’ Cover Artist, Caroline Andrus. She has an amazing history of excellent covers. I was a teenager. I knew after reading my idols, Stephen King, Anne Rice, Sidney Sheldon and many others. Always remember to market your work. Look for publishers, agents, magazines, etc, that are requesting the genre or idea that you’ve written about. Don’t think there aren’t any; there are. And if you can’t find them in the Writer’s Handbook, you can find them on the internet. Right now, I’m reading Truman Capote’s In Cold Blood. I’d read it some years ago, but it’s such a great work of true crime by Capote that I decided to pick it up again, especially after learning that it is the most rated book on Goodreads. What books are you writing? I’m wrapping up the third book in the Paranormal Investigator, titled, The Third Eye of Leah Leeds. In this book, paranormal investigator, Leah Leeds, returns to Cedar Manor to confront the memories that continue to haunt her many years later. It looks like a 2013 release, but I’m not sure what month yet. How do you keep sane as an indie author? I just stay writing as much as possible. There is more work involved as an Indie author because you alone are promoting your book. So, there is a great deal of extra time involved, but it’s all for the better. I try not to keep rituals by the hour, since anything can happen. But, I write in the day, and then I write at night also. My readers are always free to share with me their personal paranormal experiences whether though facebook or my email that’s listed in the book. I am always interested in hearing about those experiences. It doesn’t mean I’ll use them, but hearing them helps me to know what people can and cannot relate to, what they think is real, and what they think is over the top. Here’s what I thought of The Listener. 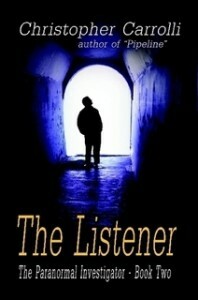 The Listener by Chris Carrolli is the second in his Paranormal Investigator Series, following on from Pipeline. Sidney Pratt, a member of the investigating team, is found unconscious and taken to hospital. While he undergoes surgery he enters the realm of ‘white light’ and he travels into his subconscious and his past, revisiting some of his long dead relatives. He hears the voice of boy that had been buried within his memories. He needs to remember what he was told as this is the key to the team’s next mystery. There is a kidnapping to solve and the menacing Roman to deal with, but he turns out to have a strong tie to the team which is going to complicate matters as they battle with the case. All the characters develop further from the first story but if you’re meeting them for the first time, you can quickly get under their skins. You understand why they do what they do. Like Pipeline, this is an extremely exciting and well written book. The plot is intricate and ingenious. There’s tension, mystery and moments of horror. You quickly get drawn into the action and have to keep reading until you reach the unexpected ending. It’s not always a comfortable read as Carrolli doesn’t hesitate to shock us but he’s a master of entertainment and has us under his spell from the first word. Every bit as good as its predecessor, The Listener confirms that this series will be a truly breathtaking one.